On hot summer nights, many people rely on an air conditioner or a fan to help them sleep. Some people sleep with a fan all year round — even when it’s cold outside, the heat will be on, and so will the fan. The benefit of fans for sleep are two-fold: they cool down the room and they provide white noise which helps some people fall asleep faster. While sleeping in a cool room is ideal (it may even help you burn more calories than a hot room), the strength of your air conditioner, and the position of your fan, may affect the quality of sleep that you receive. An interesting study recently published in the journal Energy and Buildings suggests that stronger air conditioning may actually diminish sleep quality, especially as it stops and starts. This study was small, performed on 10 adult men in good health. For the study, which was led by professor Kazuyo Tsuzuki of Toyohashi University of Technology in Japan, participants slept in a room set to a temperature of 78.8 degrees Fahrenheit. The rooms were set up with one of two air conditioners. One was a “general air conditioner,” with an average air velocity of 0.14 m/s (meters per second). The other was a “customized air conditioner,” with a lower average air velocity of 0.04 m/s. Both of these air velocities are categorized as “insensible airflow,” meaning that people are generally not aware of these low levels as they are cooled by them. Despite their categorization as “insensible,” however, there were differences in how the study participants slept when using each air conditioner. If you have trouble with sleep, adjust the airflow. First of all, every person is different. Some people may argue that they sleep better with a fan blowing directly on them, and if this is you, then that’s fine! Sleep however you are comfortable. People who sleep deeply may not notice the stop and start of an air conditioner during the night, or the rotation of a fan, so it may not matter. Everyone is different, so listen to your body. If you are a sensitive sleeper, however, and want to keep your room cool without the wakefulness, you may want to adjust your AC to a lower airflow, if possible. If you use a fan, you may wish to keep it on a steady setting, pointed away from you, rather than using the rotation setting. A fan pointed away from your bed can still circulate the air around your room, just with a much more gentle, less noticeable, breeze. If you’re having trouble sleeping, this is something you want to remedy as soon as possible. Quality sleep is absolutely essential to all aspects of your health — mental, emotional and physical. Not getting enough sleep on a regular basis can be a recipe for disease. Along with adjusting the airflow in your bedroom, check out these great tips on changing your bedtime routine, as well as these 15 remedies to get you sleeping soundly! 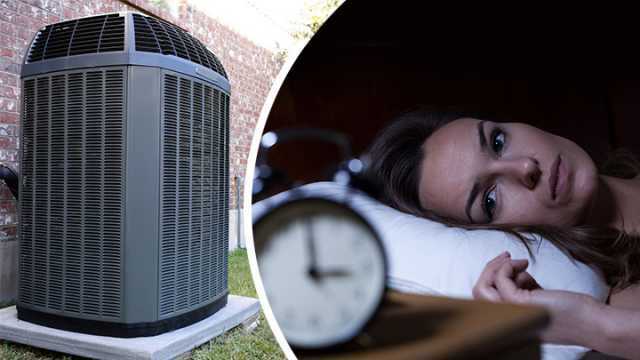 Hey Buddy!, I found this information for you: "Is Your AC Ruining Your Sleep?". Here is the website link: https://www.thealternativedaily.com/ac-ruining-your-sleep/. Thank you.